The 2nd year of the VITP tournament at Millennium Con in Austin, Texas took place on November 10-11 of this year, and I’ve finally gotten the AAR done in time for Christmas! Just like last year there were 10 total games over 4 rounds with 8 players participating at least one round. This year 5 of our contestants hailed from the Austin area, and we also had 1 each from Dallas, TX; New Orleans, LA; and Sarasota, FL. Unlike last year, which saw a 5-5 split in Japanese and Allied victories, 2017 resulted in 6 Japanese triumphs to only 3 Allied wins, with 1 game ending in a tie. The tournament is not a particularly serious affair and is open to all skill levels including brand-new players. My main goal in holding the tournament was to get a lot of the Central Texas VITP gamers together in one place with enough organization so that games take place at scheduled times and an overall winner emerges in the end, as well as to draw new players or “Victory in the Pacific?! Haven’t played that one in 20 years” folks in with a situation that is far from cutthroat but has official answers available for rules questions and a willing teacher on hand. Accordingly, players are matched with opponents randomly within the criteria that as much as possible they will play opponents from different metro areas than themselves, and play a different opponent each round. Also, if after 3 rounds there are two players with better records than everyone else who have not played each other yet, those two will meet in round 4 and that game will decide the Champion. If this is not the case, round 4 is matched like normal and the winner is decided by most total wins, then head-to-head, and then an assortment of other tiebreakers. Round 1 saw a pair of Allied victories by the father-son combo of Dell and Eric Kam. Eric defeated Hilton McManus in large part due to preventing the capture of Singapore on Turn 2, following it up by never losing Singapore the entire rest of the game. 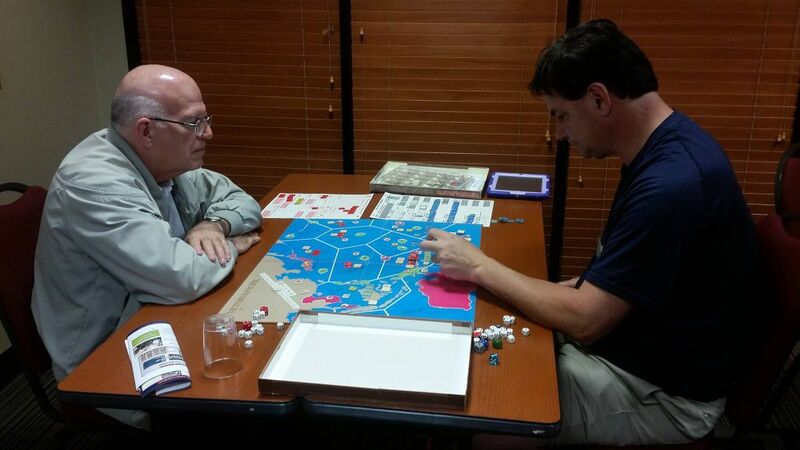 Dell scored a victory over John Lindley with a rarely-seen mid-game Okinawa invasion. On Turn 2 Dell held the Hawaiian Islands and Central Pacific, on Turn 3 he staged the two Marine units forward to Midway, and then on Turn 4 he moved them into the Japanese Islands with a sizable fleet, and one of them survived to invade Okinawa. John surrendered on Turn 5 after he failed to recapture the island. Unfortunately, after their opening-round Friday evening Allied victories, Dell and Eric had to both depart for an out-of-town wedding the next day and miss the rest of the tournament. Maybe that’s why Japan did so well on Saturday. The opening round also saw John Sharp defeat GM Daniel Blumentritt (me) in a revenge game for last year (where a rematch in the final round was unavoidable, and I ended up beating him twice). Revenge was indeed served cold as my Allied fleet was in absolute shambles and nearly the entire ocean fell under the flag of the Rising Sun; I resigned on Turn 6. In Round 2 there was a “Name’s the Same Game” as John Lindley faced John Sharp. Lindley took the Japanese and Sharp took the Allies. Both sides suffered heavy losses and the Japanese didn’t have much left to contest the late-game Allied push, but the paucity of cruisers made it difficult for the Americans to patrol into Japanese territory and Lindley was able to steal away several points and lock up the win. Meanwhile Daniel Blumentritt took the Allies and faced Hilton McManus, and going into the final turn the situation was such that it would be a draw if 1) Japan controlled only their home islands and 2) the Allies controlled the rest of the board. I tried to balance some sort of threat to knock him out of Japan and win outright on the one hand, with enough forces to hold the rest of the board and avoid losing on the other. Hilton was able to put a strong force in the Japanese Islands and also make 4 or 5 few stabs at stealing away or controlling an additional POC elsewhere. He wasn’t a favorite in any single attempt, but the problem was that I had to win all of them. I didn’t succeed in that, but he did succeed in holding control of Japan, for a hard-fought 1 POC victory. Then in Round 3 against John Lindley – who’d beaten me all three prior times we’d played - I found myself in the exact same situation, except this time I was Japan. However, John was able to do as the Allies what I was not, and hold off all Japan’s “steal” attempts. 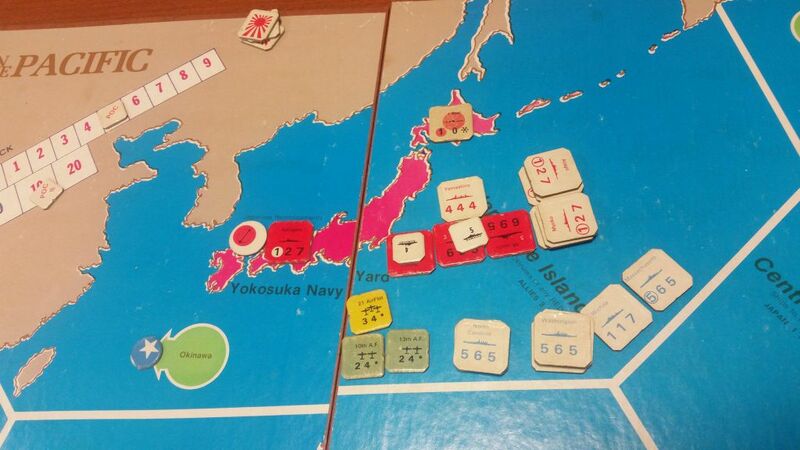 But I did control the Japanese Islands sea zone, and so the game ended in a draw. I still haven’t beaten John Lindley! Meanwhile Hilton McManus defeated the Allied navies of Andrew York, who was at Millennium Con hoping to teach a game or two of Merchant of Venus - another Avalon Hill board game that, like VITP, was designed by Richard Hamblen. Who knew he was so prolific? In the next table over John Sharp took the IJN against Cameron Thomas and started off with a dream turn 1: In Indonesia both ships were sunk and the air unit shot down, while the Pearl Harbor air unit was also destroyed along with both cruisers and all eight battleships, and then I-Boat sunk the Yorktown! This one ended quickly on Turn 3 with Japan converting both Pearl Harbor and Samoa. Since there was so much time left, John offered to restart and play a 2nd (unofficial) game with a pair of Turn-1-only adjustments that let the US keep his carriers safe if he so chooses. And John again sunk all three units in Indonesia, along with the air unit, 1 CA, and 7 BBs in Pearl Harbor, and finally the I-Boat, unable to attack a CV, finished off the last remaining BB instead! Yikes! Going into Round 4, only John Sharp and Hilton McManus had 2 wins, so they would be matched up for the championship. Cameron Thomas, who had planned on just dropping in for a single round, stuck around to prevent a rematch from having to occur, and should have been rewarded by the Gods of Gaming for this. Instead, his Allies suffered horribly on Turn 1 yet again, this time against the eventually-victorious Japanese forces of John Lindley. Nothing survived the Indonesia air raids, only 2 cruisers and the LBA survived the Pearl air raid, and then naturally the I-Boat put one of the cruisers under the waves. This meant that in 3 games as the Allies he had a combined 0 BB, 2 CA, and 1 LBA make it out of Pearl Harbor + Indonesia on Turn 1; Cameron definitely earned the hard-luck award of the tournament. For the championship match, John Sharp took the Japanese against Hilton McManus, and by Turn 3 had built a solid wall of flags Indonesia-South Pacific-Marshalls-Hawaii, along with controlling every port and base in or behind those areas except for Guadalcanal. Sounds awful for the Allies, but John had taken some heavy losses in getting to this position, and on Turn 4 Hilton managed to place control flags in both Indonesia and Hawaii as well as keeping Guadalcanal, and he was right back in the game. Then on Turn 5 [where the 2nd attached picture was taken] a host of LBA turned back the Japanese amphibious forces from Guadalcanal yet again while the Americans landed a Marine on Johnston Island, but Japan re-flagged the Hawaiians and Indonesia to prevent any major ports from falling and drive the POC higher. Turn 6 saw the Allies blow a hole in the Japanese line as the IJN attempted to fall back, allowing them to raid the Japanese Islands on Turn 7. This was good news for Hilton, as he discovered that in order to win he would have to win a fight in the JI on both Turns 7 and 8. The latter fight never materialized as John turned him back on the first attempt, ending Turn 7 with just enough of a lead to lock up the game without having the play the final turn. Congratulations, John Sharp, 2017 Millennium Con Victory in the Pacific Champion! Thank you for both writing this and creating this tournament of a great game. Sounds like some top notch playing--and die rolling--was seen.